Defend Job Philippines and the PLDT Organization of Workers and Rights (POWER) expressed condemnation over the Court of Appeals’ decision to reverse the petition for certiorari of PLDT against Labor Department’s Compliance Order to regularize thousands of contractual workers of the telecommunications giant. 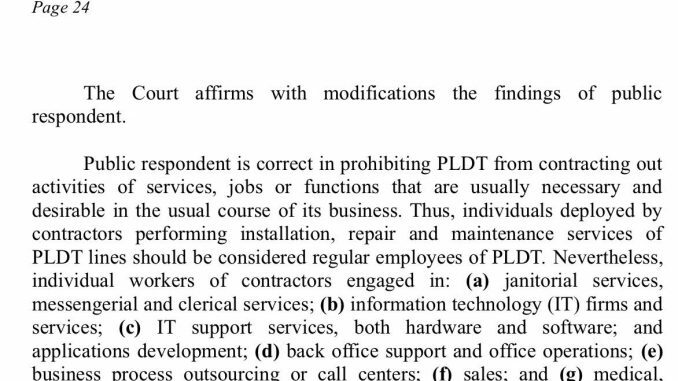 The Court of Appeals’ reversal order regarding PLDT workers’ regularization. On May 2018, PLDT filed a petition for certiorari to the CA after DOLE released a writ of execution and marked its regularization order as final and executory. The company seeked a temporary restraining order to the CA and asked it to reverse the DOLE order. The groups insisted that this decision counters the statement of the Duterte government and DOLE on their campaign to end all forms of contractualization in the country as this will further legitimize services of contractors and service agencies. “We will not allow such decision to happen as this will set a dangerous precedent to other regularization compliance orders of DOLE and to the general demands of Filipino workers to end contractualization,” said POWER President Dan Joshua Nazario. The group is planning to raise the issue in upcoming public hearings in Congress. The groups also called on all other contractual workers who are in the DOLE Compliance Order list to express their indignation over the CA ruling. For POWEr, the reversal displays a clear betrayal of CA justices to the DOLE order and to their just and legitimate calls for them to be regularized workers of PLDT. They also urged DOLE and President Duterte to take up decisive and concrete moves to counter the CA decision and for once prove to Filipino workers that he is really siding for their welfare and common good. “President Duterte must intervene on our issue immediately as PLDT is clearly executing manoeuvres to circumvent the regularization order of DOLE,” Nazario said. The post PLDT workers enraged over CA reversal of DOLE regularization compliance order appeared first on Manila Today.